When a couple hires me to plan their wedding, the first thing I do is pour three glasses of iced tea and sit down with them for a chat. I’ve seen couples become overwhelmed with all of the wedding services that are available. Everything from hiring a DJ to arranging for limo service to renting a photo booth for the wedding reception, it can all start to become a little stressful. Well, not every couple wants to sign up for all of these wedding services, so, I suggest that they list, in order of importance, the things they want for their wedding celebration. Some couples put the wedding venue at the top of their list. Perhaps they want to be married in a historic church, in a museum or even on the beach. Other couples put wedding photography at their top of their list. They want to have a beautiful collection of photos to enjoy. This list serves as a guide for couples as they finalize their wedding budget. Though I love to plan every part of a wedding, I know there a lot of couples who want to save money by handling some things themselves. Here are some of my suggestions for brides and grooms-to-be. Some couples feel obligated to have an open bar for their guests at the reception; however there are many other options. For instance, they can order several bottles of wine or champagne to serve. The number of bottles depends upon the total head count. By ordering a finite amount of alcohol, a couple won’t get stuck with a bill for expensive liquors served at the open bar throughout the night. For couples who place wedding invitations low on their priority list, I suggest they go with DIY wedding invitations. Today’s couples have multi-colored printing ink, a variety of letter fonts and endless types of computer paper available to them. They can create wedding invitations that rival those made by a professional printing press! Some brides are dead set on getting a designer wedding gown for their special day. Other brides prefer to skip the high prices found at many bridal boutiques. When it comes to purchasing a wedding dress, there are some inexpensive options to consider. There are bridal outlet stores as well as big sales at chain bridal stores. Oftentimes, former brides sell their wedding dresses for reasonable prices online. Music is a very important part of a wedding day. Asking a friend to play the wedding march on the organ could turn into disaster if the person doesn’t have the musical talents that he or she claims. I’ve heard gifted classical guitar players, flutists, harpists, and professional organists who have brought tears to my eyes during a wedding ceremony. Talented musicians can set a wonderful tone for a ceremony. It’s best to leave wedding flower arrangements to the professionals. 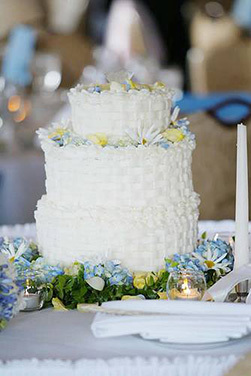 Creative florists have the know-how to put together colors that will enhance the look of a wedding venue. Also, florists have tricks for keeping flowers looking fresh throughout the day. I also advise couples to leave the wedding photography to a professional. I’ve seen what can happen when a couple asks a friend to take photos at their wedding. Yes, this saves on wedding expenses, but sometimes a couple ends up with a stack of dark or blurred photos. Furthermore, because the friend is also a guest, he or she may be talking with others and miss some great photo opportunities.